We can supply a variety maintenance products to help keep your stove or wood burner’s showroom appearance. We recommend that your chimney is swept on a regular basis, typically once or twice a year depending on how many fires you have and the type of fuel you burn. Wood that has a high moisture content will give off more smoke and soot than well seasoned dry wood. Equally house coal will produce more soot than smokeless fuels. For multifuel stoves we would always recommend smokeless coal. For woodburning stoves we recommend that you purchase a wood moisture meter to assess how seasoned your wood is. When choosing a chimney sweep look out for the NACS logo, or alternatively contact us and we will put you in touch with our recommended NACS sweep. 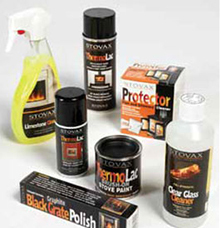 The Stovax accessories brochure has a great range of products to help you maintain your fire. We also have a great range of accessories on display in our Coventry showroom.